Countdown to Race Week Activities & Biggest Race Day in North America Is On! On Sunday, June 8, more than 300 of the world's top men and women professional cyclists will descend on the streets of Philadelphia to compete in the Commerce Bank Philadelphia International Championship and Liberty Classic. For the 24th consecutive year, the world's eyes will be on Philly as these riders take part in what is the longest-running - and largest - single-day, pro cycling event in North America. Live television coverage, 45 international pro teams (25 men's teams, 20 women's), over 300,000 fans, sponsor pavilions, and parties and picnics at every turn around the 14-mile circuit make Philadelphia the place to be on June 8. Commerce Bank Triple Crown of Cycling Parade, Rally and Concert If you're in Center City on Friday, June 6 at lunchtime, be on the lookout for riders, team cars, media vehicles and more as they kick-off the Philadelphia race with a parade around town. Beginning at 11 a.m., cyclists representing the best of the world's pro teams will ride caravan-style through Center City stopping at Commerce Bank stores at 19th & Market, Broad & Sansom and 15th & JFK Boulevard. Meet the cyclists personally, get autographs and photos and then join them for a race rally and concert at Love Park at noon! FRIDAY, JUNE 6th AT 6 P.M.
CSC Manayunk Hill Climb Are you up for the challenge? The now infamous Manayunk Wall with its 17% grade is calling you! Join in the fun as fellow cyclists test their legs and try to conquer the concrete beast. One of CSC's Pro Cycling Team riders will set the pace by establishing "a time to beat" at 6 p.m. Registration begins at 4:30 p.m. on Main Street by Levering. There will be separate categories for USCF registered and non-registered riders. For more information, visit www.bikereg.com. SATURDAY, JUNE 7th AT 7 A.M.
7 a.m. - 8:45 a.m.
Commerce Bank WOW! Family Fun Ride Open to family members 12 and older, riders can get a preview of what the international cycling stars will experience by joining in this early morning fun. Recreational cyclists, amateur racers, and families alike can take advantage of this once-a-year chance to ride the entire closed race course - the same one that the pros will compete on just hours later. Riders can register in advance at www.bikereg.com. or they can register beginning at 6 a.m. at the main staging area at Kelly Drive and Sedgely - just below the Art Museum. Registration fee is $45 in advance and $60 the day of the race. Commerce Bank Family Fun Zone While you wait for the cyclists to return to the Parkway at the start of each lap, take a stroll on the "boardwalk" in Commerce Bank's Family Fun Zone. From your favorite boardwalk rides and games to giveaways and delicious treats, the Family Fun Zone is totally FREE for everybody and sure to keep the entire family entertained. The Fun Zone is located at the steps of the Philadelphia Museum of Art, in close proximity to the start/finish line, and will be open for the duration of the race; so feel free to visit early or late, or stay all day! Some of the Commerce Bank Family Fun Zone activities include: live bands and a DJ, Dance Dance Revolution, skee ball, virtual reality surf machines and roller coaster ride, Scrambler, various photo booths, roving entertainment, games for kids and adults, and plenty of food and giveaways. While you're at the Family Fun Zone, feel free to sign the race day pledge to "go green!" For each signature received, Commerce Bank will donate $1, up to $10,000, to the Fairmount Park Commission. Triple Crown Lifestyle Expo Expo tents will be brimming with exciting offerings (just across from Eakins Oval) on race day. There is no charge to enter the expo area which will be open to the public and will feature food, entertainment, product sampling and the latest goods and services from the health and fitness industry. Junior PCT Grand Prix Be sure to check out the sport's next generation of stars - Junior riders 14 to 18 years-old who have qualified to compete in the Grand Prix. They'll tear around the loop between Logan Circle and Eakins Oval. . .FIVE TIMES! Nestled between the end of the women's race and among the men's laps, the event starts at approximately 11:45 a.m.
Cadence Cycling Foundation Youth Tour - Time Trial Philadelphia kids ages 9-18 will take to the Ben Franklin Parkway at 22nd Street to ride in a 200-meter, straight-line time trial as part of the Cadence Cycling Foundation's (CCF) Youth Tour. 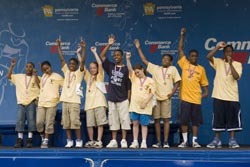 The participating youth are from Philly's inner-city neighborhoods, and they've been training all winter and spring for this opportunity on cycling's main stage - cheer them on! The mission of CCF is to promote widespread participation in youth cycling. For more information on these activities and additional race week information, log on to www.procyclingtour.com. To experience race day from the comfort of the exclusive Champions Club on Eakins Oval, go to www.procyclingtour.com to purchase VIP tickets for the very best in race day accommodations and transportation. About Commerce Bank Commerce Bank, "America's Most Convenient Bank," is a leading retailer of financial services with 470+ convenient stores in New Jersey, New York, Connecticut, Pennsylvania, Delaware, Washington, D.C., Virginia, Maryland and Florida. Commerce is headquartered in Cherry Hill, N.J. For more information about Commerce, please visit the company's interactive financial resource center at commerceonline.com, or call 888-751-9000. About Pro Cycling Tour The Commerce Triple Crown of Cycling is managed by Pro Cycling Tour, LLC of Audubon, PA. Pro Cycling Tour is dedicated to the development of quality cycling events and programs in the United States. For the latest news on all three races, go to www.procyclingtour.com.